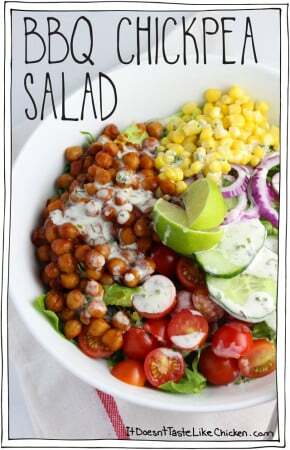 There is magic in this salad. The first touch of magic is with the marinated and baked mushrooms bacon. Chewy, gorgeous mushrooms that burst with salty and smoky deliciousness. Then more wizardy takes effect with baked tofu chunks. I made this addition on a total whim and let me tell you, these tofu chunks are the most chicken-like tofu I’ve ever made. I’m going to have to introduce these babies all on their own in another recipe, because, YUM. Tender, lightly seasoned, and 100% yum. Put it all together to make a salad and what do you got? 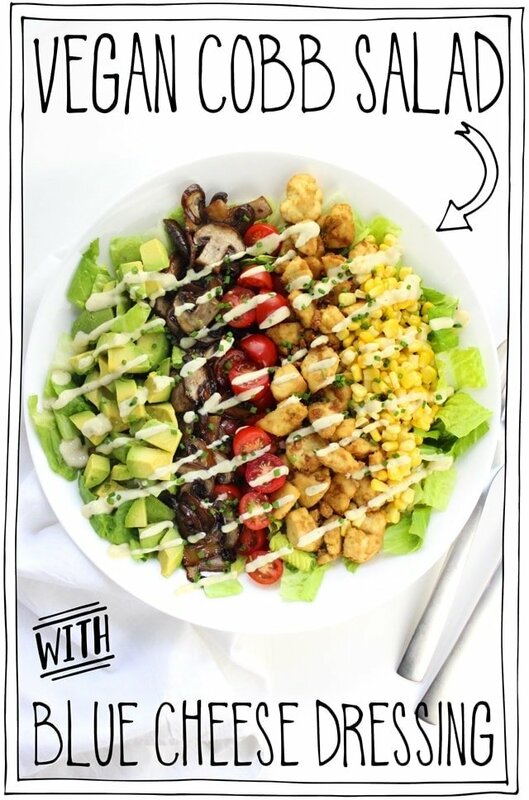 Flavour bursting mushroom bacon, tender baked tofu, creamy avocado, juicy cherry tomatoes, sweet pops of corn on a bed of crispy romaine topped with a vegan blue cheese dressing. ← Now THAT is magic. 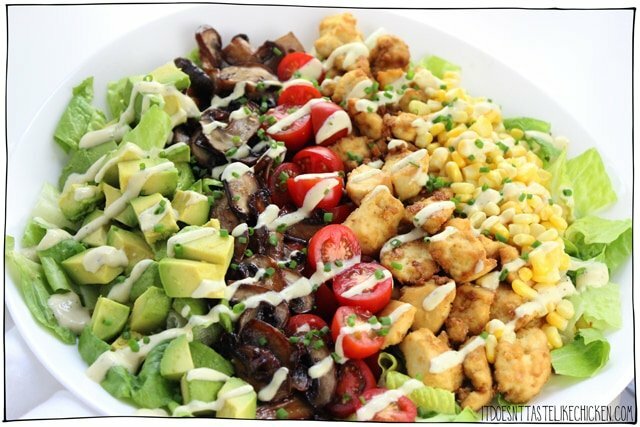 To make Vegan Cobb Salad with Blue Cheese Dressing: in a medium bowl, mix together the nutritional yeast, olive oil, soy sauce and garlic powder. 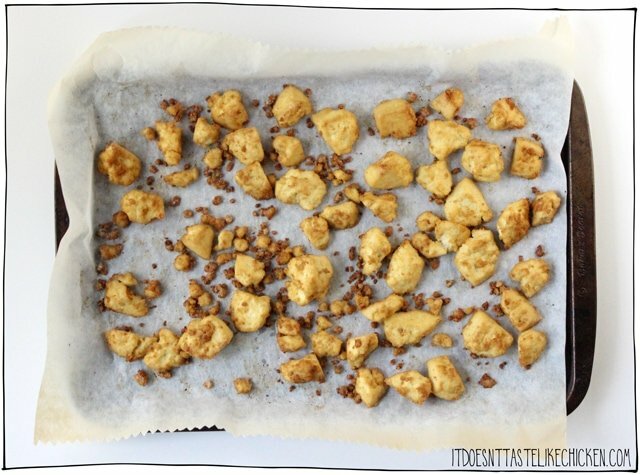 Break the block of tofu into small chunks and add them to the bowl. Toss well to evenly coat. 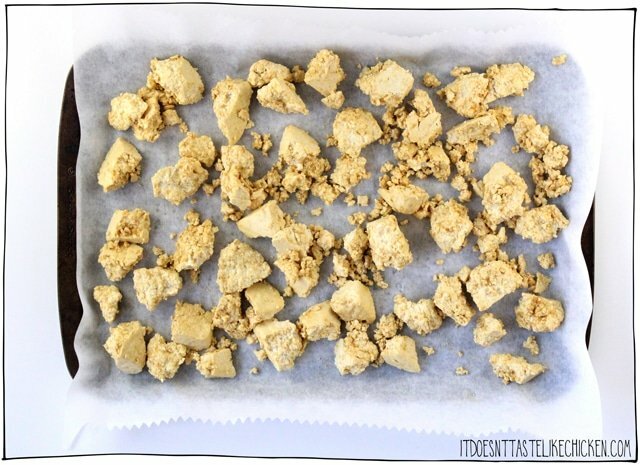 Spread the tofu evenly across one of the baking sheets and bake about 30 minutes, stirring every now and then until lightly golden. Now for the mushrooms, in another medium bowl, mix together the olive oil, soy sauce, maple syrup, and liquid smoke. Add the sliced mushrooms to the bowl and gently toss to evenly combine. 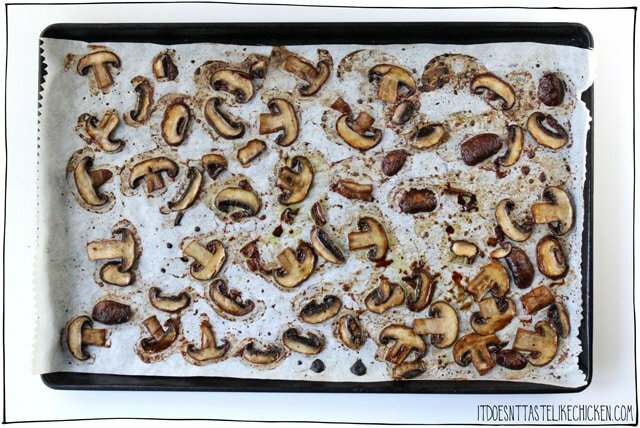 Spread the mushrooms slices in a single layer over the remaining baking sheet, and pour over any leftover marinade. Add to the oven along with the tofu and bake for about 20 minutes until dark golden and reduced in size. 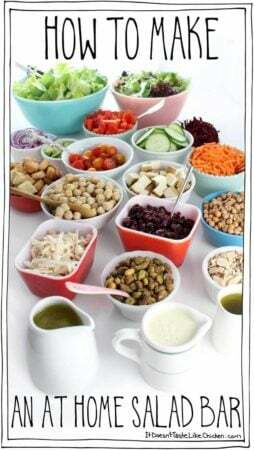 Assemble the salad: on a large platter, evenly spread the romaine lettuce. Top with the smoky mushroom bacon, tender baked tofu, cherry tomatoes, corn kernels, and avocado. I like to display each ingredient separately in a row for a rainbow effect but feel free to display your veggies however you like. Add the vegan blue cheese dressing to taste and garnish with chives. 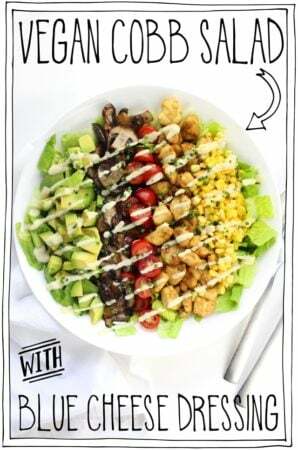 Flavour bursting mushroom bacon, tender baked tofu, creamy avocado, juicy cherry tomatoes, sweet pops of corn on a bed of crispy romaine topped with a vegan blue cheese dressing. ← Now THAT is magic. Preheat your oven to 375F (190C). Line 2 large baking sheets with parchment paper. 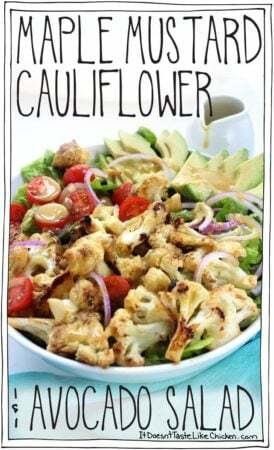 In a medium bowl, mix together the nutritional yeast, olive oil, soy sauce and garlic powder. Break the block of tofu into small chunks and add them to the bowl. Toss well to evenly coat. In a medium bowl, mix together the olive oil, soy sauce, maple syrup, and liquid smoke. 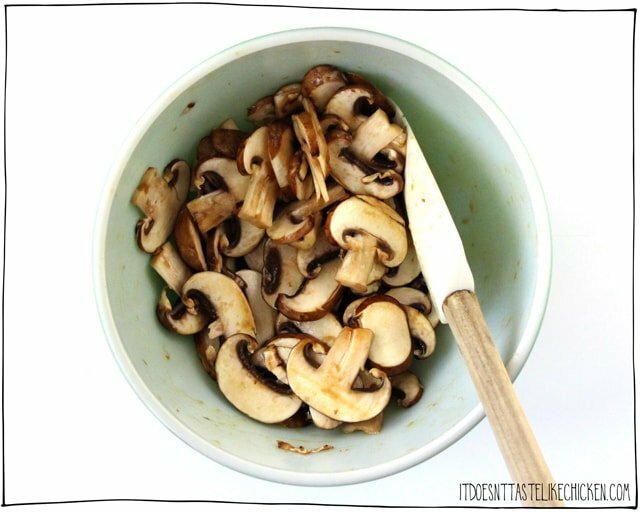 Add the sliced mushrooms to the bowl and gently toss to evenly combine. On a large platter, evenly spread the romaine lettuce. 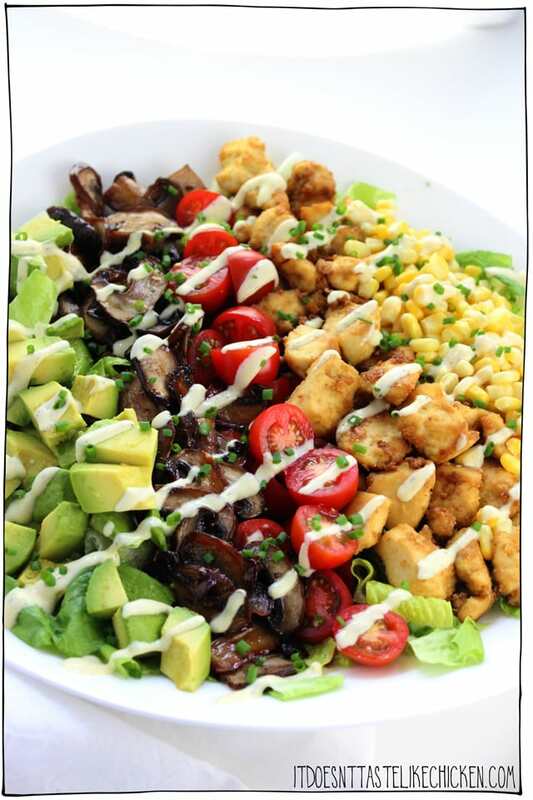 Top with the smoky mushroom bacon, tender baked tofu, cherry tomatoes, corn kernels, and avocado. I like to display each ingredient separately in a row for a rainbow effect but feel free to display your veggies however you like. Add the vegan blue cheese dressing to taste and garnish with chives. The mushrooms and tofu are great served both hot or cold. Calories do not include the dressing. 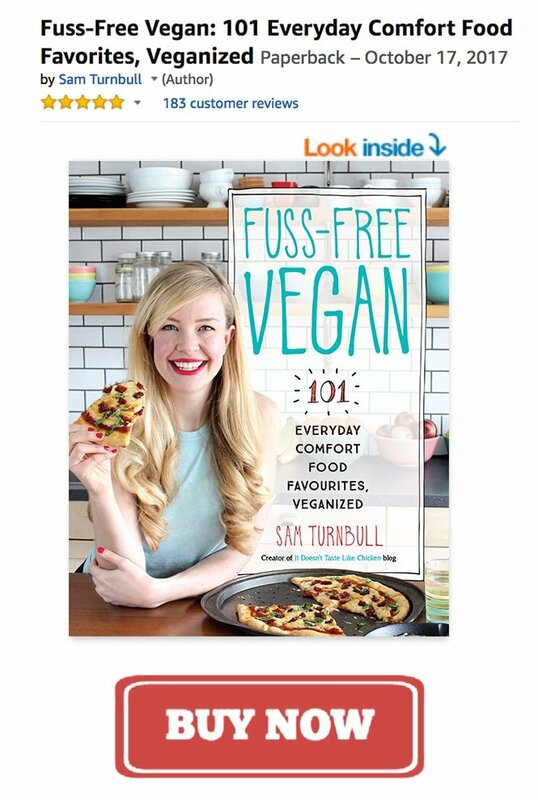 Previous Post: « Fuss-Free Vegan cookbook GIVEAWAY!!!! 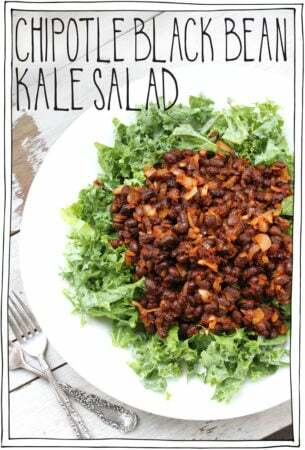 I am planning on making this for quite a crowd and wonder if the mushrooms and tofu can be done the day before? Yes, that should work just fine. I hope everyone loves it! Do you by chance have a recipe for the dressing? Of course, the dressing is linked in the recipe itself, or you can click here. You’ve done it again Sam! Delish!!!! You are the reason my family and I have been able to stay vegan for 2 yrs now! You create simple, nutritious and delicious recipes that the whole family can appreciate and enjoy! Made this salad tonight. It is delicious! Next time, I will add even more mushrooms! Bahahaha! Love it!! That sounds delicious! LOVE this! What I find amazing is that you are using essentially the same coating for the “chicken” nuggets as you do for the tofu crumbles, but somehow it tastes more like chicken! Made this last night for dinner and it is just great. 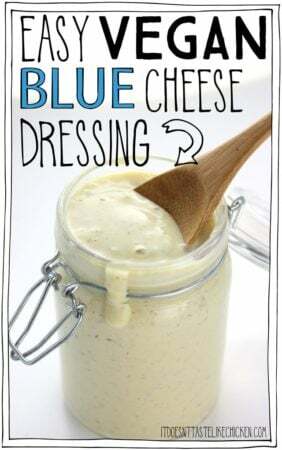 I have been using your blue cheese dressing pretty often at lunch, so I threw together a siracha dressing instead (Veganese, lime juice, soy milk, cumin, coriander, & Siracha) and the whole thing was delicious. 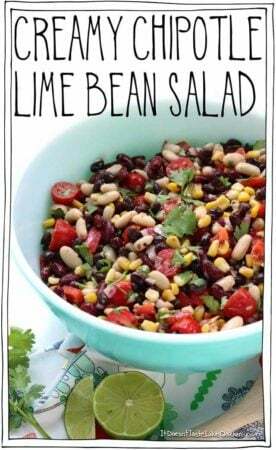 This recipe would be good for casual entertaining in the summer. I always look forward to your new recipes each week – and I am still loving your cookbook! Speaking of which – your waffles freeze very well! I have a defrost setting on my toaster and they are perfect! Hi Nikki! I have very limited experience with air fryers, so while I am sure it would work fine, I don’t know at what temperatures and how long it would take. Sorry, I can’t be more help!